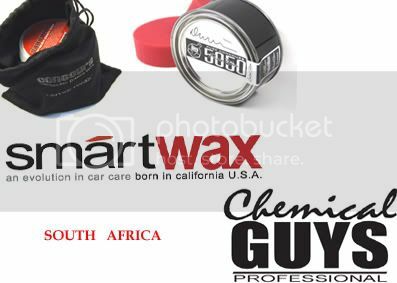 Smartwax and CG have setup a distributor in Cape Town. His business name is Karismatic Motorworld,based in Atholne ,Cape Town.He is fully stocked up with the Smartwax and CG product range. If anyone wouldlike to contact him you may do so on 072 596 7966, Speak to Nazeer. Are he a member of the Waxon Forum? (05-05-2010 03:54 PM)onyx Wrote: Are he a member of the Waxon Forum? Just a "cheapskate" question ... Is his prices aligned to the Poor-Boys opening specials? Ah, good news. Cape Town needs more places to buy detailing products from. (10-05-2010 11:11 AM)kripstoe Wrote: Ah, good news. Cape Town needs more places to buy detailing products from. Lol... I never knew the smartwax and CG stuff were in such demand until i joined this forum! Tornado Red - VW Golf GTI... What would you use? And I was just online yesterday thinking that I would have to order these prodcuts online...good news.